The value of your home can easily diminish throughout the years if you do not stay current with design trends. A few modern kitchen improvements will catch the attention of potential buyers to influence the desire to buy. Not to mention the benefit of enjoying the remodel efforts throughout the time that you reside in the home. We have compiled a list of kitchen trends for 2016 so that all of your design choices make sense. The first thought that most people have regarding modern design is the use of neutrals. Begin the entire design with this timeless element so that you have plenty of options to stylize in other ways. Soft whites, light gray, and browns are all hot shades for 2016, but they are paired with rich accent colors. Natural wood, bamboo, and stone materials are always popular design elements when you want to integrate different textures and colors. 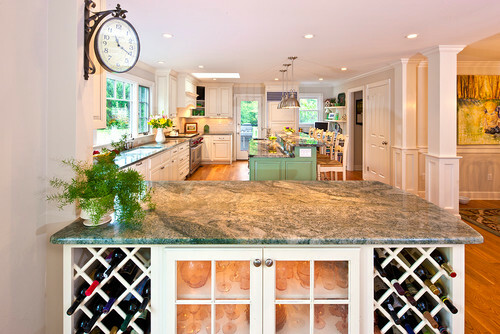 Follow Flemington Granite’s board The White Kitchen on Pinterest. Bulk and thickness are quickly being replaced by slim, elegant countertops. Believe it or not, these thin countertops are still resistant to heat, moisture, or shock resistance with the elimination of extra size. A thin countertop is a great feature in a modern design, and quartz continues to lead the material options. There are plenty of eye-catching styles that feature different colors and unique patterns. Plain kitchen cabinets are never in style, especially if they are worn out and old. Reach for a more spectacular look with frosted doors or decorative drawer pulls. 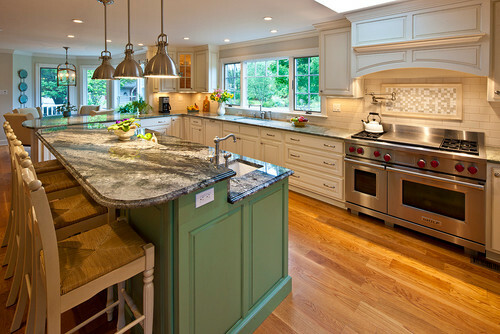 As long as you emphasize clean lines, any renovations that you make are going to enhance the kitchen design. If the walls are already neutral, consider incorporating a touch of bright color to really make the cabinets stand out. Hardwood is always a smart remodel choice that features a multitude of texture options. Implementing rich tones into the flooring design retains the updated look for many years after installation, especially as part of a contemporary design. 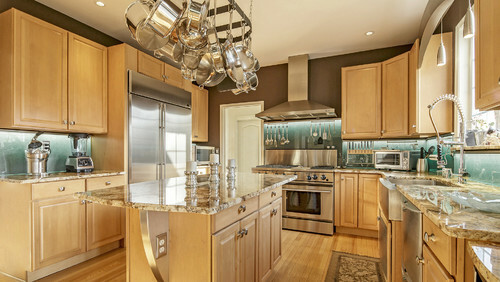 Warm browns, like mahogany, pair better with a more traditional kitchen style. Gaining popularity this year is the use of gray tones in interior design because it’s an often overlooked neutral option. Despite what some may say about stainless steel, it’s a classic style that is not going out of style. The polished look is easy to match with other decor and you can incorporate some of the same elements in other parts of the kitchen. If you are looking for something new and unique, black stainless steel finish is available through KitchenAid. When it comes to the lighting aspect, 2016 continues the trend of statement lighting design. Don’t limit yourself to the necessary fixtures because additional lighting options make it easier to change the ambiance to suit your mood. Enhance the elegance of your kitchen with a mosaic tile backsplash or a mixture of metal materials. Glass is easy to incorporate into a tabletop or cabinet doors for a more open, chic style. Even if you prefer the look of cool metal options, both are very easy to clean and maintain. Whether you want to update your kitchen according to next year’s trends, or you prefer to stick with timeless home improvement elements, we have plenty of ideas to offer. Set up a visit with our designers through the contact form so that we can help you pick out new materials and complete the remodel project to your specifications.